As I tipped back a Singha beer (they didn’t have Chang, as MDP pointed out), I noted the ambient music playing at Ruay Thai. It was Top 40s singles from about a year ago. Just like what they play at Yum Yum Queens. And at just about every other Thai restaurant I’ve ever been to. An interesting trend. Ruay Thai is pretty good. It’s small and easy to miss, but located just across the street from the sprawling Armenian church where one of my good friends recently got married. You certainly can’t miss that, so consider it your landmark. I hummed along to “Somebody That I Used To Know” as we chowed down on tofu fries and curry puffs for our appetizers. 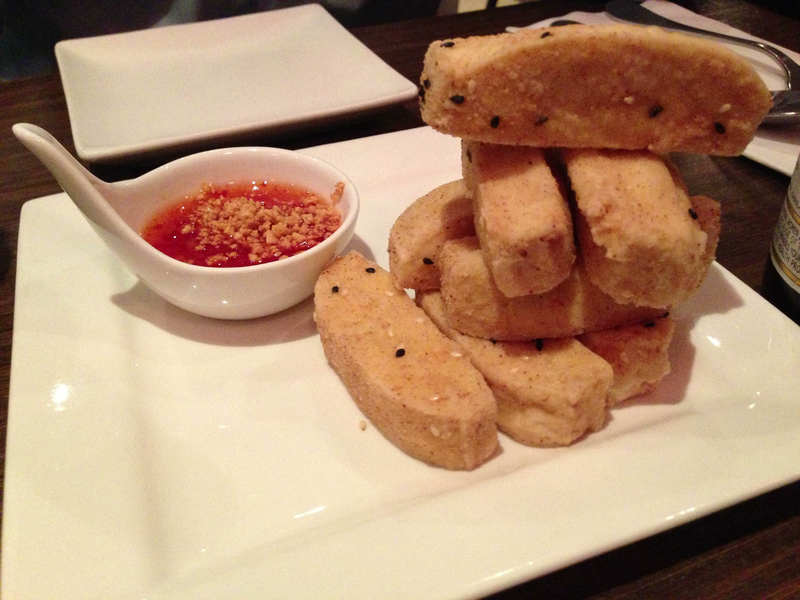 The tofu fries were stacked like Jenga pieces on a medium-sized square plate. The sauce that accompanied them was sticky and sweet, and perfectly complemented the blank-canvas fried tofu pieces. I also enjoyed the curry puffs, which were soft, flaky and deliciously filled. The whole reason why we went to Ruay Thai, which, being located on Second Avenue, is somewhat of a hike from our respective work places, was because they have drunken noodles on their menu. So, of course, I ordered it. Fresh wide-cut noodles were mixed with Thai basil, chili, onions and bell peppers to form a fantastic, spicy dish. My Dining Partner (MDP) ordered the red curry with chicken, which was equally spicy as the drunken noodles. The curry itself was perfect. It reminded me of Yum Yum Queens’ rendition, except it had a certain kick that I liked. His stomach was burning after dinner–a good sign, I assure you–so we headed down to the Shake Shack for chocolate custard. They do have desserts at Ruay Thai, but I didn’t want any of them. If you’re in the neighborhood, try Ruay Thai. I noticed another Thai restaurant on the same block, but I don’t think they have drunken noodles. And, if you don’t want Thai but need nourishment after a long church service, do try Baby Bo’s, which is right next to Ruay Thai, for some top notch Mexican fare. Take the 6 to 33rd Street. Walk east a few blocks then north on Second Avenue.